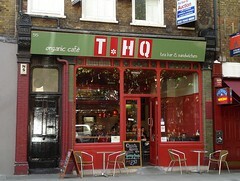 T.HQ was a tea shop in Holborn, located on Grays Inn Road near the junction with Theobalds Road. It has now closed. According to Google Street View, by June 2012 it had been replaced by a Lebanese restaurant called Chamisse. Tea shop in Holborn, located on Grays Inn Road near the junction with Theobalds Road. They have a reasonable selection and variety of teas — as of April 2009 their drinks menu included eleven black teas, four green teas, one oolong tea, one pu-erh, two white teas, eight herbal teas, and three infusions. They also do organic coffee and fruit juices. Cakes are displayed on the counter, and sandwiches/rolls in the fridge. They seem to do some form of proper food too — on our August 2010 visit we were informed that "food stopped at 2:30pm", and a sign on the wall advertised "supper from 5:45pmish" on weekdays. Order and pay at the counter, and they'll bring your tea over to you. Tea is served with the leaves still in the pot (inside a little insert). Not sure if you can ask for a second brewing. Although they don't recommend milk in most of their teas, they will provide it if you want. secretlondon visited in April 2009 to try their "hot drink and a cake or savory for £2.50" offer. When I arrived at 5pm the only savories were sausage rolls. I had a slice of coffee and walnut cake, which was nice, and a pot of wild blackberries black tea, which was enough for two cups. Soft music (Simon and Garfunkel) was playing in the background. Kake and James visited in August 2010, and also took advantage of the tea-and-cake deal (which at that point was £2.75 and only available after 2:30pm). Arriving a little before 4pm, we weren't the only customers, though there were plenty of free tables. Music was playing, but mostly drowned out by the hum of the fridge. A generously-sized pot of white peony tea was priced (similarly to most of the teas on the menu) at £1.95 — according to the menu they also do two-person pots of all their teas, for £1.10 extra. For our tea-and-cake deal we had the pu-erh and a slice of carrot cake (the latter being rather darker than is usual for carrot cake, but still pleasant). Accessibility: Short ramp to get in (the fairly steep smoothed-over step style). Only half of the door was open on our August 2010 visit, making the entry fairly narrow. The toilet is down a flight of stairs with a handrail on one side and a tight turn at the bottom. Last visited by Kake and James, August 2010. Last edited 2016-04-15 07:03:54 (version 6; diff). List all versions. Page last edited 2016-04-15 07:03:54 (version 6).